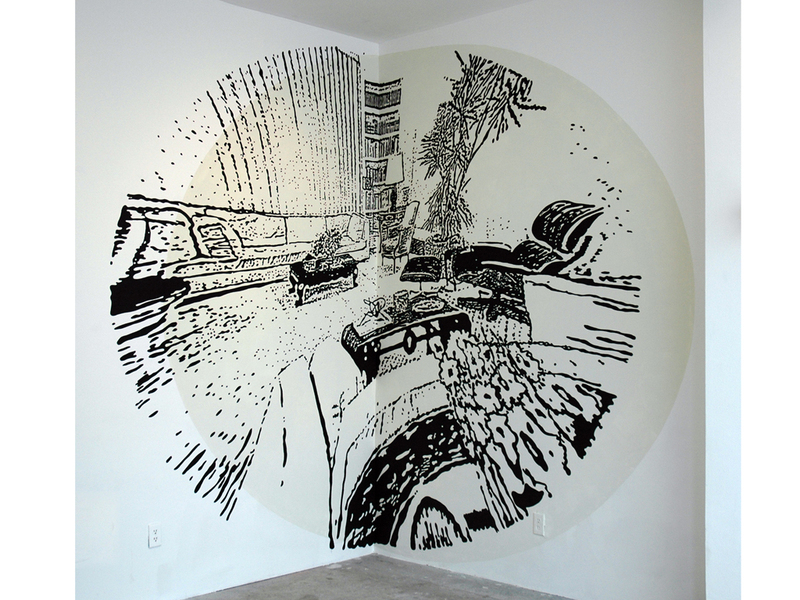 Latex on Walls, 9 ft. x 132 ft. The images in Looking-Glass House are derived from old magazine depictions of historical, traditional American homes that are combined, drawn from, manipulated through a computer and then blown-up to room-size. 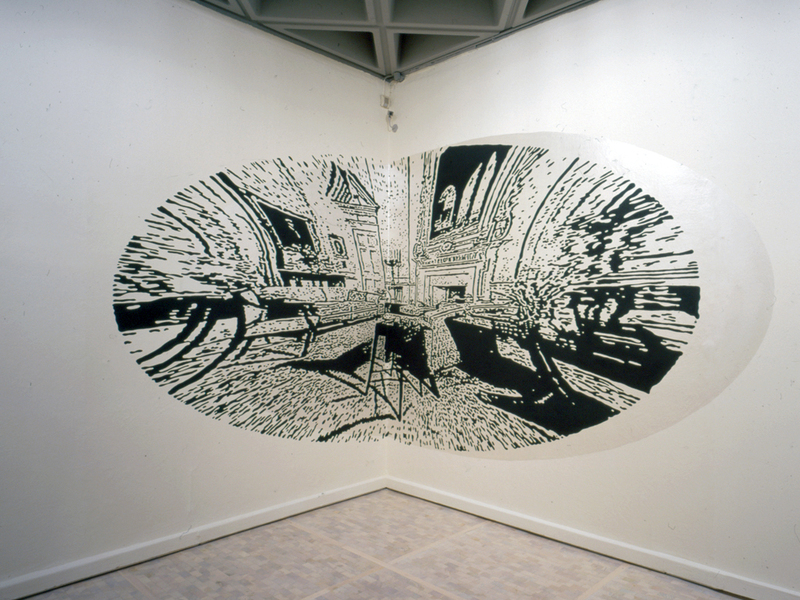 The image is painted with black lines on a silver shape onto the surface of the walls of the gallery. 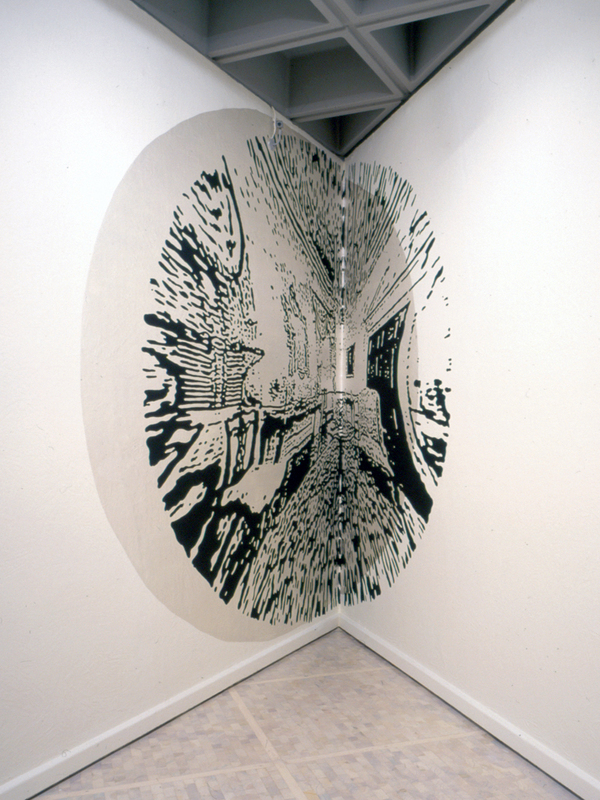 Like images on the surface of a mirror, the rooms in Looking-Glass House could be seen as a distorted reflection of real rooms or as glimpses into a series of imaginary rooms. 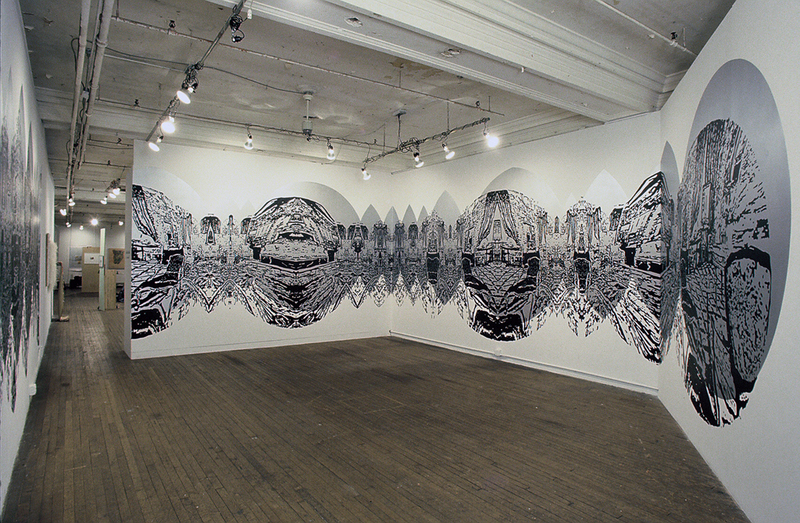 Latex on plastic, 10 ft. x 30 ft. and 10 ft. x 20 ft. 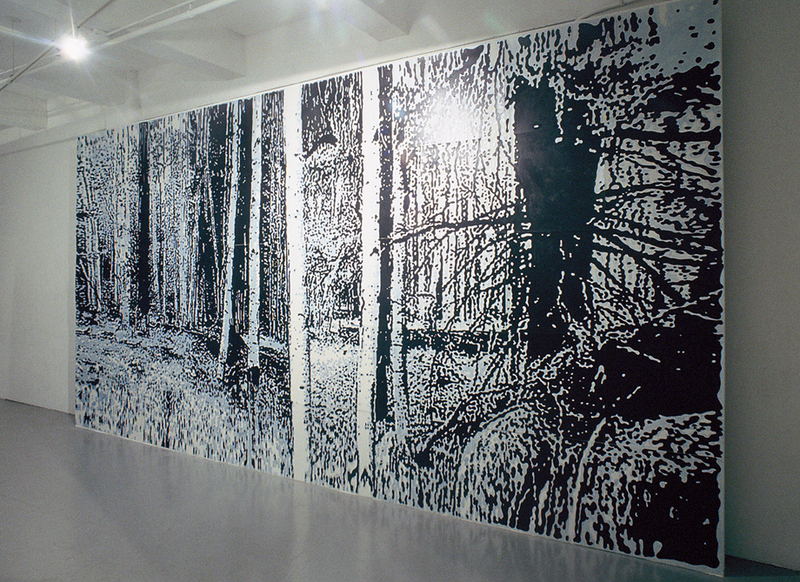 This installation transforms the walls of the gallery into two opposing, yet connected illusionistic spaces: a rustic early American interior and a wooded grove. In these paintings, black and pearlescent painted lines and blobs on a grid of frosted Mylar coalesce into image from a distance while dissolving into abstraction up close. Operativo, Museo Rufino Tamayo, Mexico City, Mexico. A life-sized traditional American interior is painted onto the wall of the museum. 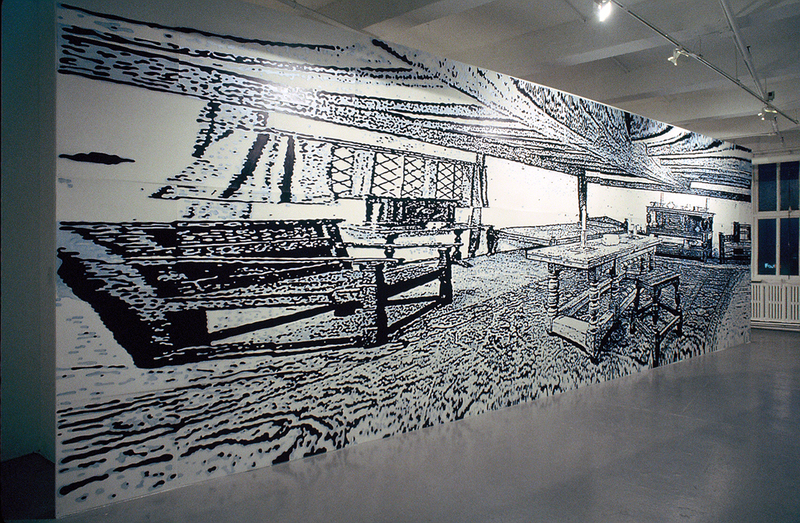 The work plays with the relationship between pictorial and architectural space. This painting was designed as a DIY project. The image can be painted onto any wall by anyone following a simple pattern contained in a kit with instructions, brushes and paint. Designed as a multiple.